Our group works in the broader field of Quantum Biology and Chemistry (QUBIC), developing out-of-the-box ideas for some of the most intriguing problems at the interface of chemistry, physics and biology. In the emerging field of Quantum Biology, we are developing molecular spectroscopy techniques and quantum-confined materials to provide transformative solutions for detection, diagnosis, and therapy. Our work in detection entails development of facile breath sensing, bioimaging, and optical DNA sequencing techniques. These methods utilize volatile biomarkers in human breath as a quick, inexpensive, and non-invasive detection of human health and wellness; use the window of nominal biological transparency I and II, which combined with photon upconversion, can provide a versatile optical bioimaging and detection system; and provide tools for block molecular identification for different biomolecules using optical molecular vibrational spectroscopy. Development of diagnostics techniques in our group comprises of single-molecule Quantum Molecular Sequencing and Quantum Point Contact Sequencing, based on nanoelectronic spectroscopy, towards a combined genomics, transcriptomics, and epigenomics method. In our efforts towards novel precision therapeutics, our group is developing highly-selective nanotherapies using quantum-confined semiconductor nanomaterials, and using precisely tailored molecular interactions in the cellular environment, to develop targeted therapeutics to eliminate multi-drug resistant pathogens and address the burgeoning problem of antimicrobial drug-resistance. This precision medicine model can also be directed towards molecular therapeutics for a range of targeted diseases. Our work in Quantum Chemistry is directed towards novel photon upconversion; developing transformative nanoscale catalysts for solar-fuel generation using selective quantum-confined states of nanomaterials, and other physical phenomenon like hot-carriers; and developing hybrid nano-bio photocatalysts which combine the selective photochemistry of nanoscale inorganic catalysts with selective fuel generation in biological systems. CU Boulder researchers are developing new techniques for faster, more cost-effective single-molecule DNA sequencing that could have transformative impacts on genetic screening, paving the way for advances in vaccine development, early cancer detection and organ transplants. The new methods—one of which is based in nanoscale quantum electronics and one in optics—could one day allow a person to sequence his or her genome in under two minutes using simple equipment, said Prashant Nagpal, an assistant professor in CU Boulder’s Department of Chemical and Biological Engineering. “We are exploring unique methods of providing accurate, useful genetic information faster and cheaper,” said Nagpal. DNA sequencing, which determines the precise order of nucleotides contained in biological molecules, can be used to map individual genes or entire genetic regions. Since its inception in the 1950s, sequencing has been incorporated into medicine, evolutionary biology and other bioscientific fields, all while increasing in speed and processing power by entire orders of magnitude. Nagpal describes his new research as a timely reimagining of a technology that has existed for decades, but has run up against fundamental limitations in recent years. The current sampling method, Nagpal says, opens the possibility for replication errors in the larger data set that might overlook fine-grain markers in a person’s genetic profile. Single-molecule sampling, he says, offers a more accurate picture. Nagpal and his team turned to quantum electronics for the solution. They send a small charge through a DNA or RNA molecule, and record measurements of all nucleotides in single-molecules. The sequence identified the nucleotides with 99.7 percent accuracy, up from 80 percent achieved by other nanotechnology methods. The advances in quantum-based sequencing were described recently in the journals ACS Nano and Journal of the American Chemical Society. The W.M. Keck Foundation provided support for all the single-molecule sequencing research. Nagpal has also been developing an optics-based method for single-molecule sequencing that uses a diode laser and a camera comparable to that of an average smartphone to rapidly identify nucleotide sequences. Because of its unique physical properties as both a particle and a wave, light is a nimbler means of gathering information and transmitting it in compressed form. In a forthcoming paper currently in press in the journal Small, Nagpal and his colleagues demonstrated a high-throughput sequencing method can be massively parallelized using a two-millimeter chip array that can take seconds instead of hours. The research is still in the early stages, and Nagpal says that the next step would be to apply the sequencing methods to more complex bacterial samples. In the future, he envisions a portable DIY sequencing kit that would cost around $1. A person could take a DNA swab, put it onto the microchip and wait 100 seconds to receive data that could reveal potentially risky genetic markers for cancer, for example, or provide crucial information for doctors attempting to match organs to transplant recipients. Other co-authors on these single-molecule sequencing methods include Lee Korshoj, Sepideh Afsari, Manjunatha Sagar, Gary Abel and Assistant Professor Anushree Chatterjee, all of CU Boulder’s Department of Chemical and Biological Engineering. Our work and research were highlighted in an article entitled "Six grand ideas to fight the end of antibiotics". The world is nearing a moment when antibiotics no longer work to treat infections. We are severely over-using the antibiotics we have – and that system is causing bacteria to evolve and develop resistance to the drugs intended to kill them. Appropriately, the phenomenon is referred to as antibiotic resistance, and it’s shaped up to be one of the biggest challenges we face in the 21st Century. The stakes are high. The good news? A whole slew of governments, organisations, innovators, and scientists across the globe is pondering how to get us out of this mess. Together with colleague Anushree Chattetrjee, who works on developing new therapies for antibiotic treatment, Nagpal wondered if the light-responsive dots could be used to fight superbugs. The result was a new form of quantum dots that can selectively target bacteria. “What it could mean is that these quantum dots can be present everywhere, and when developed completely as a therapy, they can be activated by light to clear infections in animals or humans without killing the host mammalian cells,” Nagpal says. When activated, the dots produce just enough a substance that is toxic to bacterial cells, but harmless to the host’s own cells. When testing the dots in cell cultures, the dots had no effect on healthy human cells. And light exposure to activate them could be as little as a room light or the sun (or a more directed LED for deeper infections). They could theoretically be so effective, that they would only require a one million-times smaller dose than traditional drugs. Quantum dots are easily and cheaply manufactured so scaling them up to treat infections on a worldwide scale would cost just a few cents (or less) per dose. Light-activated nanoparticles, also known as quantum dots, can provide a crucial boost in effectiveness for antibiotic treatments used to combat drug-resistant superbugs such as E. coli and Salmonella, new CU Boulder research shows. Multi-drug resistant pathogens, which evolve their defenses faster than new antibiotic treatments can be developed to treat them, cost the United States an estimated $20 billion in direct healthcare costs and an additional $35 billion in lost productivity in 2013. CU Boulder researchers, however, were able to re-potentiate existing antibiotics for certain clinical isolate infections by introducing nano-engineered quantum dots, which can be deployed selectively and activated or de-activated using specific wavelengths of light. Rather than attacking the infecting bacteria conventionally, the dots release superoxide, a chemical species that interferes with the bacteria’s metabolic and cellular processes, triggering a fight response that makes it more susceptible to the original antibiotic. The findings, which were published today in the journal Science Advances, show that the dots reduced the effective antibiotic resistance of the clinical isolate infections by a factor of 1,000 without producing adverse side effects. While other previous antibiotic treatments have proven too indiscriminate in their attack, the quantum dots have the advantage of being able to work selectively on an intracellular level. Salmonella, for example, can grow and reproduce inside host cells. The dots, however, are small enough to slip inside and help clear the infection from within. Overall, Chatterjee said, the most important advantage of the quantum dot technology is that it offers clinicians an adaptable multifaceted approach to fighting infections that are already straining the limits of current treatments. Going forward, the researchers envision quantum dots as a kind of platform technology that can be scaled and modified to combat a wide range of infections and potentially expand to other therapeutic applications. Co-authors of the new study include Colleen Courtney, Max Levy, Samuel Goodman, Pallavi Bhusal of CHBE; Corrella Detweiler and Toni Nagy of the Department of Molecular, Cellular and Developmental Biology; and Nancy Madinger of CU Denver’s Division of Infectious Diseases. BOULDER, COLORADO — Scientists have been creating antibiotics to kill deadly bacteria for nearly 80 years. Unfortunately, the bacteria that cause disease can adapt so quickly, some have evolved into superbugs that are resistant to all antibiotics, and making new drugs is a long, expensive, involved process. That’s why scientists at the University of Colorado’s Biofrontiers Institute are looking beyond biologically-based medicine. 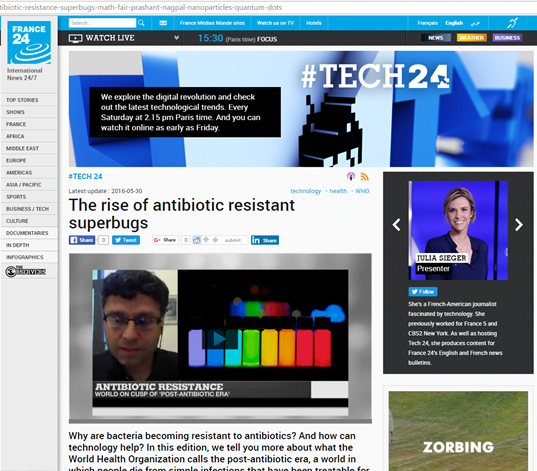 They’re developing an “antibiotic” that they can update with the click of a keyboard. To reach this goal, Nagpal’s lab analyzes the DNA of superbugs, then creates a highly targeted antibiotic, not in years, but in just a few days. He does this by making the antibiotics out of quantum dots - tiny semiconductor particles. Each quantum dot is 20,000 times smaller than a living cell. When millions are mixed with water, ultraviolet light reveals different varieties that glow in beautiful colors of yellow, orange and green. For stopping a superbug, Nagpal says a tube as small as a thimble can pack a mighty punch. And if the superbugs adapt quickly, researchers can quickly change the next round of quantum dots. In the ever-escalating evolutionary battle with drug-resistant bacteria, humans may soon have a leg up thanks to adaptive, light-activated nanotherapy developed by researchers at the University of Colorado Boulder. Antibiotic-resistant bacteria such as Salmonella, E. Coli and Staphylococcus infect some 2 million people and kill at least 23,000 people in the United States each year. Efforts to thwart these so-called “superbugs” have consistently fallen short due to the bacteria’s ability to rapidly adapt and develop immunity to common antibiotics such as penicillin. New research from CU-Boulder, however, suggests that the solution to this big global problem might be to think small—very small. In findings published today in the journal Nature Materials, researchers at the Department of Chemical and Biological Engineering and the BioFrontiers Institute describe new light-activated therapeutic nanoparticles known as “quantum dots.” The dots, which are about 20,000 times smaller than a human hair and resemble the tiny semiconductors used in consumer electronics, successfully killed 92 percent of drug-resistant bacterial cells in a lab-grown culture. “By shrinking these semiconductors down to the nanoscale, we’re able to create highly specific interactions within the cellular environment that only target the infection,” said Prashant Nagpal, an assistant professor in the Department of Chemical and Biological Engineering at CU-Boulder and a senior author of the study. Previous research has shown that metal nanoparticles—created from gold and silver, among other metals—can be effective at combating antibiotic resistant infections, but can indiscriminately damage surrounding cells as well. The quantum dots, however, can be tailored to particular infections thanks to their light-activated properties. The dots remain inactive in darkness, but can be activated on command by exposing them to light, allowing researchers to modify the wavelength in order to alter and kill the infected cells. “While we can always count on these superbugs to adapt and fight the therapy, we can quickly tailor these quantum dots to come up with a new therapy and therefore fight back faster in this evolutionary race,” said Nagpal. The specificity of this innovation may help reduce or eliminate the potential side effects of other treatment methods, as well as provide a path forward for future development and clinical trials. Nagpal and Chatterjee are the co-founders of PRAAN Biosciences, Inc., a Boulder, Colorado-based startup that can sequence genetic profiles using just a single molecule, technology that may aid in the diagnosis and treatment of superbug strains. The authors have filed a patent on the new quantum dot technology. The new study was co-authored by Colleen Courtney, Samuel Goodman and Jessica McDaniel, all of the Department of Chemical and Biological Engineering at CU-Boulder; and Nancy Madinger of the University of Colorado Anschutz. The W.M. Keck Foundation and the National Science Foundation supported the research. Nagpal and Chatterjee labs are the co-founders of PRAAN Biosciences, Inc., a Boulder, Colorado-based startup based on a novel sequencing technology called "Quantum Molecular Sequencing" that can sequence genetic profiles using just a single molecule, technology that may aid in the diagnosis and treatment of superbug strains as well as genetic disorders and cancer. The authors have filed number of patents on the new technology. PRAAN in Sankrit means "life." CU Technology Transfer Office also has recongnized Quantum Molecular Sequencing technology developed by our and Chatterjee lab with the New Inventor of the Year award. We are developing a platform technology for fast, reliable, high-throughput and cost effective single molecule sequencing of nulciec acids.This kind of sequencing is an important step in the developement of new diagnostic tools for personalized medicine, identifying disease biomarkers, and developing novel targets for vaccines and therapy. More than 30% of the incident radiation from Sun is invisible infrared light, or “heat”, which cannot be absorbed by solar cells designed to convert light into electricity. Converting this infrared radiation efficiently into visible light can significantly increase the efficiency of photovoltaic conversion of sunlight into electricity, and open up avenues for using other waste-heat sources to generate electricity. Moreover, since the infrared light can also penetrate biological tissues, it can also provide a pathway for simple biodetection and bioimaging applications simply by using invisible infrared light sources, instead of ionizing X-rays or other invasive procedures. The biggest hurdle towards converting “heat” radiation into visible light, known as upconversion, is low efficiency. Intense infrared light from a laser can be easily used to energetically combine two light particles, or photons, into single visible photon or light radiation. However, diffuse sunlight or low intensity infrared sources (intense infrared radiation can damage tissue) have very low upconversion efficiencies, making this process infeasible. Researchers from Assistant Professor Prashant Nagpal’s group utilized low intensity infrared light to generate quasiparticle Surface Plasmon waves on inexpensive nanofabricated metal chips. While we can all use lenses to focus light, dual nature of light as particle and wave prohibits using simple lenses to focus light beyond their wave-like length scales. These surface plasmon waves can squeeze light into a spot million times smaller than the incident light wavelength volume, thereby focusing diffuse sunlight into a “laser-like” spot on top of metal pyramids. The researchers also placed doped-lanthanide nanoparticles on the pyramid tips, which absorb these infrared waves, and enhanced the transfer of energy to higher energy Erbium levels, which emits the visible radiation. The researchers showed that on these chip scale devices, not only the light intensity gets enhanced into the focused light spot, but these plasmon waves also enhance the transfer of energy to higher energy levels by several-fold, leading to 80 or 100 fold enhancement in emitted visible light! Therefore, this research can open pathways for improving solar energy conversion, imaging infrared radiation, using waste-heat energy sources, and developing new bioimaging techniques using simple infrared light sources. This research was recently published in journal Nano Letters. Along with Prashant Nagpal, the study was conducted by Chemical Engineering postdoctoral associates Qi Sun (first author) and Vivek Singh, graduate student Josep Ribot, along with colleagues Haridas Mundoor and Ivan Smalyukh in the Physics Department. Simultaneous reduction of carbon-dioxide (CO2) and water using sunlight has been an important step in life cycle on earth. This single reaction performed by plants in an energetically frugal, albeit inefficient process, allows simultaneous balance of CO2 gas and energy harvesting from primary source of energy on earth, the Sun. Several strategies are being investigated currently for converting sunlight into viable renewable source of energy, to address the growing emission of greenhouse gases and depleting sources of cheap energy for burgeoning human population. Developing an efficient artificial photosyntheticprocess to carry out simultaneous reduction of CO2 and water can address this issue of rising level of greenhouse gas emission and provide an alternative source of renewable energy. While several research groups have been trying to develop titanium dioxide (TiO2) nanoparticle catalysts, using expensive metals (like platinum) as chemical dopants for obtaining high catalytic activity, lack of insights into energetic pathways governing multi-electron reduction of CO2 into selective fuels has impeded further research. Researchers from Assistant Professor Prashant Nagpal’s group recently utilized measurements of electronic density of states (DOS) of nanoparticle catalysts, to identify energy levels responsible for photocatalytic reduction of CO2-water in an artificial photosynthetic process. They introduced these desired states in their nanoparticle catalysts, using dopants or semiconductor nanocrystals, and the designed catalysts were used for reduction of CO2 selectively into hydrocarbons, alcohols, or aldehydes. Using their new design strategy, they also demonstrated a new composite nanocatalyst which shows highest selectivity for hydrocarbon solar fuels (ethane here, >70% selectivity), and high catalytic activity. They also demonstrated that their inexpensive nanocatalyst (4.3% internal quantum efficiency) outperforms platinum-doped TiO2 nanoparticles (2.1%), using a small solar concentrator (4 X solar radiation). Their study can have important implications for development of new inexpensive photocatalysts with tuned activity and selectivity. This research was recently published in journal Nano Letters. Along with Prashant Nagpal, the study was conducted by Chemical Engineering postdoctoral associate Vivek Singh, and graduate students Ignacio Beltran (co-first author) and Josep Ribot. Prashant’s recent NSF CAREER Award will support further development of other nanoparticle catalysts for making selective solar fuels. Can Moore’s Law make a comeback? Several independent analyses have now pronounced: “Moore’s law is dead”, almost 50 years since its inception. While there are very few people who disagree that we have reached the limit of miniaturization of two-dimensional semiconductor circuits, there may be hope for extending, and even perhaps reviving the Moore’s Law (or a newer version of it), by stacking transistors in the third dimension. Intel’s 3D fin design for processors shows that some of the undesirable effects of nanoscale miniaturization in electronic devices like high leakage current and reduction in rectification factor of transistors can be addressed by spatial extension in the third dimension. This also opens up a new dimension (literally!) by stacking planar semiconductor devices and increasing the density of transistors per unit volume. Recent research from Nagpal group suggests that there can be new advantages in adopting novel semiconductor architectures in 3D. They recently showed that the large surface areas in these nanoscaled devices can now be utilized to tune the electronic properties of these semiconductors, and using new physical properties as a result of tailored surface interactions. While most semiconductor devices rely on two-degrees of electronic control (semiconductor channel bias and gate voltage), they have added a new dimension by showing novel “air-gating” and “chemical-gating” in hollow TiO2 semiconductor nanotube devices, and highlight the potential for development of novel 4D transistors (by using channel bias, gate voltage, chemical composition and concentration) using these nanostructures. Air-gating (left) and chemical-gating (right) observed in hollow TiO2 semiconductor nanotube devices. Using TiO2 semiconductor as an important candidate for power electronics, hollow nanotube devices made by Nagpal group showed a tunable rectification factor (transistor ON/OFF ratio or Iforward bias/Ireverse bias) from 1-1000 by simply changing the air pressure! Using chemical-gating, they reversibly altered the conductivity of nanoscaled semiconductor nanotubes (10nm-500nm TiO2 nanotubes) by 6 orders of magnitude, with tunable rectification factor ranging from 1 to1,000,000. They also show that this orders-of-magnitude change in rectifying behavior occurs due to the tunability of the depletion widths in these thin oxide nanotubes by adsorption of water-vapor, and interesting transitions in charge transport behavior. While demonstrated air- and chemical-gating speeds were slow (~seconds) due to mechanical-evacuation rate and size of their chamber, small nanoscale volume of these hollow semiconductors can enable much higher switching speeds can be achieved with further research, limited by the rate of adsorption/desorption of molecules at semiconductor interfaces (KHz to MHz switching speeds can be obtained). These chemical-gating effects were completely reversible, additive between different chemical compositions, and can enable semiconductor nanoelectronic devices for “chemical transistors”, and very high-efficiency sensing applications. This first demonstration of “air-gating”, “chemical-gating”, “chemical transistors” and “chemical diodes” opens up new and exciting possibilities of added dimensionality (4-D transistors) for control over transistor properties (source-drain voltage, field-effect of voltage gating, and chemical gating using composition and concentration of vapor), with fundamental insights into tunable depletion widths, and two-dimensional charge conduction in these important widebandgap semiconductor nanotube materials. Similar surface tunability and chemical-gating behavior can also be expected in other quasi-one dimensional nanostructures, opening up the possibility of developing functional devices and studying interesting 2D charge conduction properties in these semiconductor nanostructures. Our group discovers the first single-molecule RNA sequencing and structure detection method, paving the way for probing the sequence-structure-function relationship within the transcriptome at an unprecedented level of detail. The results are now published in journal Chemical Science. Our manuscript on assessing different reactive oxygen and nitrogen species (ROS and RNS) for design of therapeutic QDs is now published in journal ACS Appl. Biomaterials. Emerson wins National Science Foundation's Graduate Research Fellowship. Congratulations Emerson! Our manuscript on design of QDs for selective light-activated nanotherapy is now published in journal Frontiers in Chemistry. Our patent on doping wide bandgap semiconductors and synthesizing nanostructured semiconductors for photocatalysis and making fuels from sunlight is now issued (US Patent: 9873115). Our discovery of Block Optical DNA Sequencing is now published in journal Small. University of Colorado and some news outlets highlight our discovery of single-molecule DNA sequencing techniques. BBC features our quantum dot nanotherapeutics work as "Six grand ideas to fight the end of antibiotics". Our discovery of characterizing and binning single-nucleotide measurements by conformational entropy for improved single-molecule DNA sequencing is now published in Journal of the American Chemical Society. University of Colorado and several news outlets highlight our discovery of antibiotic potentiator against multidrug-resistant superbugs. Our discovery of a new single-molecule DNA and RNA sequence identification method is now published in ACS Nano. Our discovery of antibiotic potentiator using stimuli-activated superoxide generation with quantum dots is published in Science Advances. Our group developed Quantum dots to create mutant E.coli for improved NADPH production for making biofuels, in collaboration with Ryan Gill's group. Our group demonstrates nanotube membranes for solar fuel generation using differnt shallow and deep dopants in journal Phy. Chem. Chem. Phys. Our manuscript on Standalone anion- and co-doped titanium dioxide nanotubes for photocatalytic and photoelectrochemical solar-to-fuel conversionis now published in Nanoscale. Local ABC NEWS Denver Channel 7 Reporter Interviews Prashant and Anushree regarding their discovery of light-activated therapy! Watch the highlight and News Coverage. Our discovery of a novel light-activated therapeutic for multidrug-resistant bacteria is now published in Nature Materials! Our manuscript on Long Range energy Transfer using Quantum Dot-DNA complexes is now published in Nanoscale. Sirisha Gudavalli, a Fairview High School student working in our lab, won the ASM International, the National Vacuum Society, and the International Society for Optics and Photonics, along with two scholarships to CSU and CU Engineering and 1st place in Chemistry. Congratulations Sirisha! Our group discovers Nanoelectronic Fingerprints for identification of DNA nucleobases, their protonated and unprotonated states, isomers, and tautomers. The manuscript is now published in J. Phys. Chem. B. Our manuscript on charge conduction through exciton shelves and higher charge collection efficiency for hot carriers is now published in Applied Physics Letters. Sam wins GAANN fellowship. Congratulations Sam! Our manuscript on new two-dimensional (2D) nanomaterials (lead, copper, silver and cadmium chalcogenides) and their photophysical and optoelectronic properties is now published in The Journal of Physical Chemistry Letters. Our NSF MRSEC IRG team funded with $6 Million over 6 years. Our manuscript on Multiple Energy Exciton-Shelves in Quantum Dot-DNA Nano-Bioelectronics is now published in The Journal of Physical Chemistry Letters. Our team awarded DURIP grant from Army Research Office (ARO) for development of "Nanoscale Optical Imaging and Spectroscopy from Visible to Mid-infrared". Nanoscaled-Silicon is now a direct-bandgap material! Our findings on pseudo-direct bandgap transitions in silicon, and it's effect on optoelectronic and thermoelectric properties of silicon is now published in Nanoscale. Our paper on transparent conducting oxide nanotubes published in Nanotechnology is highlighted byNanotechWeb, and selected aspublishers pick by IOP and IOP Select! Our team awarded Phase I grant by Defense Advanced Research Projects Agency (DARPA) under Living Foundaries: 1000 Molecules program. Our Upconversion manuscript highlighted by Nature Materials and other media reports! Design of nanoparticle catalysts for Artificial Photosynthesis manuscript published in Nano Letters. Prashant wins NSF CAREER Award! "Plasmon-enhanced energy transfer for improved upconversion of infrared radiation in doped-lanthanide nanocrystals" published in Nano Letters. Logan wins UROP fellowship. Congratulations Logan! Josep wins Balsells fellowship. Congratulations Josep!